The elder is common throughout the UK, being found in woodlands and hedgerows. It is also found growing on 'waste ground' and may be regarded as a 'weed' by some. 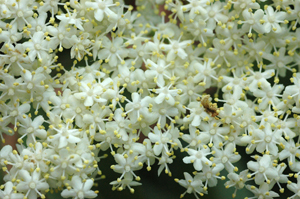 The flowers of the elder are often gathered for the making of elderflower tea (also, are much visited by insects), and the berries for elderflower wine. Birds consume the berries and thereby assist in the dispersal of the seeds. The timber of elder is quite soft - but was used in the past for carving and wood whittling. 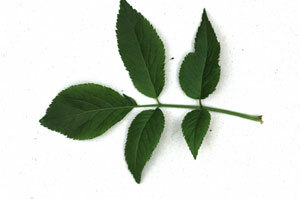 The leaf is a compound, pinnate leaf with 5 or 7 leaflets. Each leaflet is longer than it is wide. The edge of each leaflet is serrated / toothed. 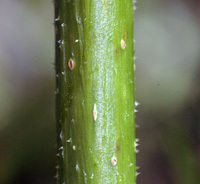 There are small hairs present on the underside of the leaflets. 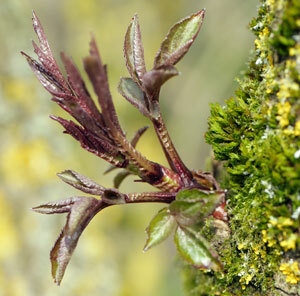 When the burst burst after winter, the emerging leaves have a distinct red tinge to them. Young twigs are green, but as they age the outer layer turns grey. They often have distinct small brownish / beige bumps. These noticeable little bumps or lumps are breathing pores or lenticels. The buds are arranged in pairs - opposite to one another. 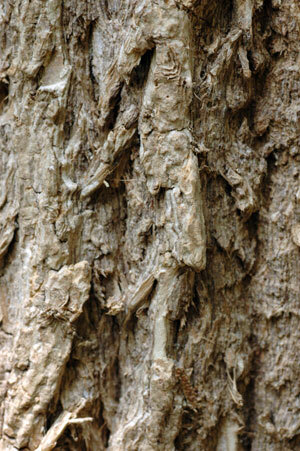 The bark is often quite gnarled, grooved or corky in appearance. The tree or shrub is often covered with a profusion of tiny white flowers in the spring, which give rise to the purple elderberries later in the year.